What’s the story with women and shoes, do you think? Is it a truth universally acknowledged that every woman is “obsessed” with shoes? Nah. I’m not buying that. Despite what I discovered during my painstaking, and painful I might add, research. All the gushingly, hyperbolic blog posts about shoes, and the articles showing the supposedly ‘enviable’ fashionista closets, and the many hundreds of pairs of shoes certain celebrity fashionistas have in these closets. Apparently Celine Dion confided to Ellen Degeneres that she has over 3000 pairs. Or was that Imelda Marcos? I’m a bit confused. And no wonder… I’ve seen way too many pictures of pink closets today, with rows and rows of gold shoes… hmmm, whose closet was that? Oh yes, Mariah Carey… I think. But despite all this palaver over shoes, I don’t believe every woman is obsessed with shoes. I know I’m not. But that doesn’t mean that shoes aren’t an important, even vital, part of a great outfit. In fact, quite the contrary. Shoes can make or break an outfit. The minute you put them on and look in the mirror, you know. They’re either too chunky, too prim, too flat, too high in the heel, not high enough… or just right. And if they’re just right, they make a good outfit look even better. Right? Contrary to the opinion of some of my friends and acquaintances, I don’t own a ton of shoes. I counted them when I read that Celine Dion statistic. I own 23 pairs of footwear. That includes sandals, flats, ankle boots, over-the-knee boots, heels, loafers, and my trusty Stan Smith Adidas. I didn’t count my running shoes or my Hunter fishing boots in that total. And of those 23 pairs, I have my favourites. Well, you’ll know that if you read my blog regularly. I repeat the same shoes and boots. Over and over. I’m very happy with my brown Paul Green ankle boots that I bought last fall. I particularly love them with flares or with boot cut jeans, as you can see. Below are some of the shoes in my closet that don’t get out enough, but which I kept when I did my closet cull last spring. I love the silver hardware on the black, chunky-heel Stuart Weitzman pumps. And the caramel, platform T-strap heels look so great with a skirt. I bought the Tod’s driving shoes with my retirement gift card from my work buddies in 2013; they never go out of style. I also have a pair of chocolate brown, suede Prada booties with a small heel that I don’t wear nearly enough, but I’ll probably never give away. Because…well… Prada. One day I’ll wear them again. So if you look at the fact that of the 23 pairs of footwear I own, 6 are not worn regularly… and 2 pairs I didn’t mention are probably on the way out very soon… I think I can be classified as a shoe minimalist. At least in my books. But that doesn’t mean I don’t love shoes. Just that I shop wisely, buy what I love, and then love them for a long time. You know, I started thinking about all this shoe stuff a couple of weeks ago when I was sitting in airports, travelling to and from New Brunswick where I was visiting my mum. 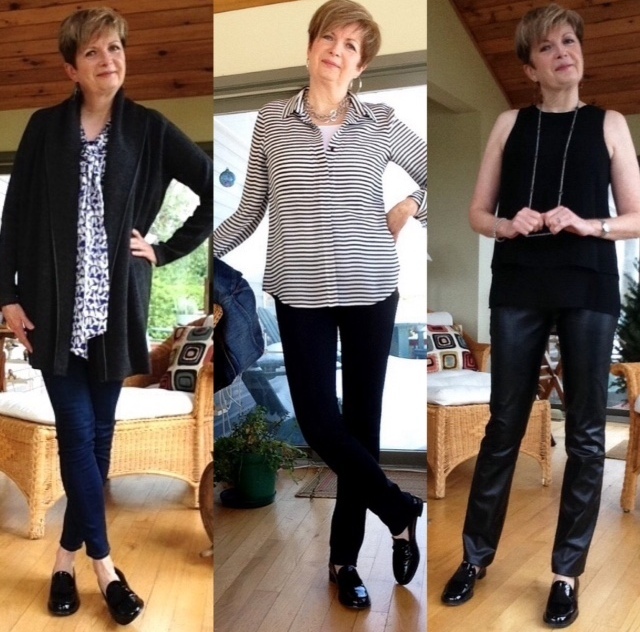 In the Montreal airport, in the Fredericton airport, in the Toronto airport… I began to notice how many women were wearing exactly the wrong shoe for the rest of their outfit. In particular the wrong shoe and pants combination. Trainers and mom jeans seemed to be a popular choice for women travellers, with the jeans pooling on top of their sneakers in a very unattractive way. 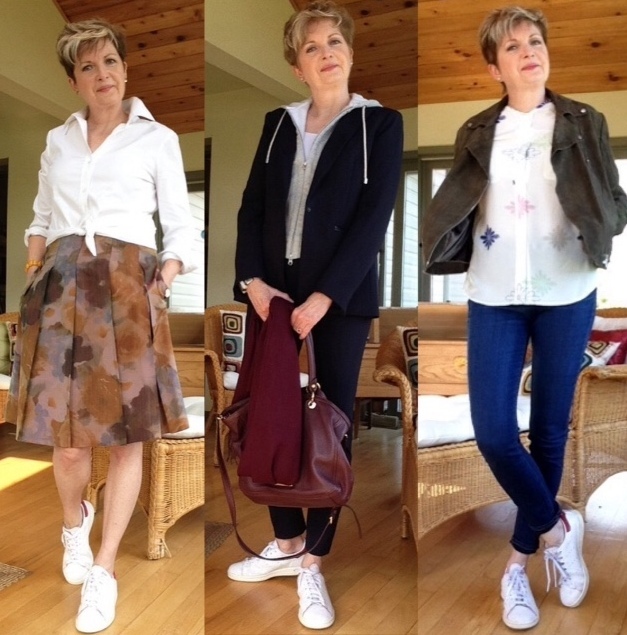 A different shoe or maybe hemming or rolling the pants could have made all the difference. You don’t need to be obsessed with shoes to do that, do you? I’m not talking about when you’re out walking the dog or going for your morning run, but when you actually plan to be out in public. I mean, there has to be a middle ground between wearing trainers with totally inappropriate pants and feeling the need to own 3000 pairs of shoes. Don’t you think? Enough of that. I’m beginning to sound cranky. And what the heck am I driving at, anyway? Well, only that despite how it might appear in fashion-blogger-land, we’re not all obsessed with shoes. Doesn’t mean that we don’t love shoes. Or that we think shoes are unimportant. They definitely are. They definitely can make or break an outfit. But how many pairs do we really need, anyway? I mean… really… need? So, that’s my shoe story for today, folks. And I’m sticking to it. I could go on. About shoes and work, and the wild rumour when I was the English head at my school that you had to have good shoes to work in my department. Ha. Remembering that makes me laugh. Now it’s your turn. What’s your story? Are you a shoe minimalist? Or maximalist? Or somewhere in between… or maybe you don’t care much one way or the other? Do tell. Currently committed to managing with three pairs for ten weeks as I travel (we'll see what I come home with though! ), and that includes my runners (I bought a black pair that easily double as a street shoe, thanks to the current trend for a sleekly-sneakered foot). And as part of our downsizing, I gave away a few beloved pairs I'd had for years but was scarcely wearing anymore (can still enumerate those quite precisely and will probably miss them from time to time — but I don't have a 3000sq.ft. closet!). 23 seems like a very reasonable number to me. . .
And you are travelling in a tricky shoe season. I remember when we were in Australia and new Zealand one year. We were away for three months. I needed to bring my hiking boots, and running shoes for hiking and walking, so I only packed my good flat sandals for going out for dinner. But when we reached Sydney at the end of the trip it was May, their autumn, and cool and rainy the whole time. I couldn't bear to go barefoot in the evening, especially if we were walking to restaurants. So hiking boots it was…with jeans. Better to be warm and comfortable than freezing in sandals and nice cropped pants. It was dark, anyway, so no one noticed. Sounds as if you have been lucky to find that many pairs. I will admit that part of my desire to hang onto shoes and boots is that my foot is also a difficult fit, and I have to work so hard to find appropriate shoes. Plus this usually means that I have to buy good, and generally more expensive shoes to fit me… and then can't bear to get rid of them. Now I'm spoiled. I hate shoes made of cheap leather, and find them really uncomfortable. I can imagine that standing on your feet so much combined with the tendency of feet to swell during air flights must have made for many, many shoe and foot issues for you. And combined with silly footwear requirements this must have been a real pain…. in both senses of the word. That said, there are more and more stylish comfortable shoes out there, so of course I'm forced to try them. 😉 I tend toward Paul Green, Munro and La Canadienne, plus sandals by Naot and Think. My sneakers are New Balance, Keen, and Josef Seibel. And I did count my dog walking boots and bike shoes, so hopefully I don't sound too crazy. Ha! 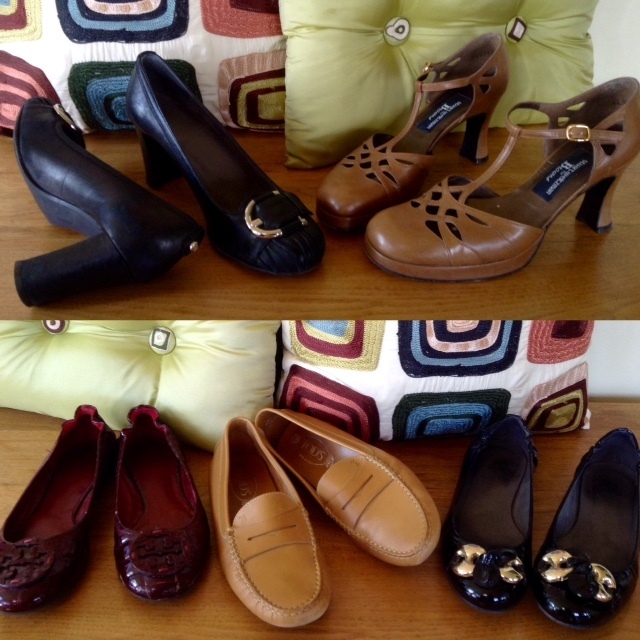 I've also kept a couple of shoes for sentimental reasons (bought in Paris, a fun wedding, etc.) although I'm unlikely to wear them again. I guess I'll have to pass them along some day. Sigh. I love that there are so many chic and comfortable shoe choices these days. I still remember the first time I wore non-athletic sneakers to work… with nice cords and my good leather jacket… so wonderful, comfortable, even freeing… and it wasn't even casual Friday:) 53 pair sounds sensible to me, especially if you included athletic shoes… and since they are stackable in your "tall" closet. I keep insisting I am not addicted to shoes, but then I look up at all the boxes of shoes in my closet and think…maybe I am. I haven't counted…I will get back to you with that. But, I do think shoes are fun…though sadly my funky feet keep me mostly in flats. Good post! I'm smarter about shoes now than I used to be… when I was younger I would have bought many more pairs if I could have afforded them. But now earrings… they are hard to resist. I have a hard time finding shoes that are comfortable, the older I get. Right now I've reverted to just buying Stuart Weitzman because they're stylish shoes and come in a wide and even an exta-wide width. They're so comforatable and last forever so I don't mind spending extra on them. My "Guy Thing" suede loafer just arrived this morning and I'm in love! All in all, though, I probably have about 18 pair of shoes and tend to mostly wear 3 or 4 of them. 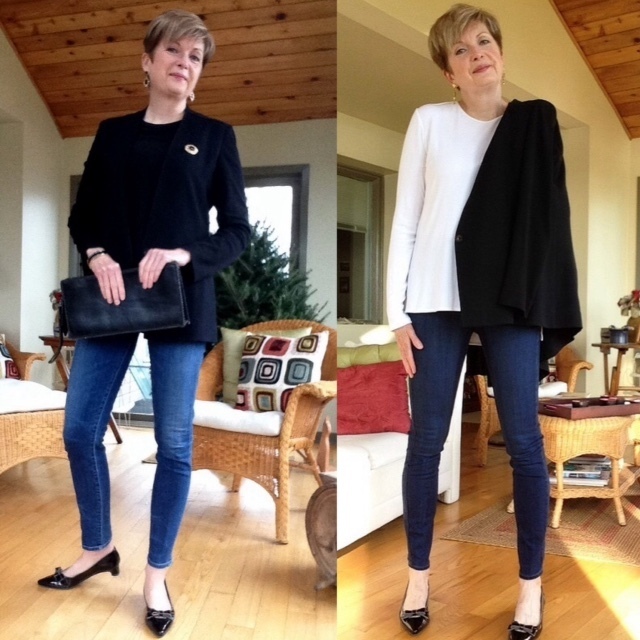 By the way, I just discovered your blog a couple of weeks ago and loved the Mossimo Dutti white shirt so I ordered it – that arrived this morning too and it looks great on me so it's been a fun day! Enjoy your blog! I rarely wear heels anymore. Only for special occasions. Gosh, I used to wear them all the time. At work, out for dinner after work…not sure how I did that. I agree it's about style and not a huge overflowing closet of shoes. How can one cherish each pair if one has so many?? Will count – but I suspect I am around your 20 ish. Not at all obsessed with shoes but I'd say I definitely have too many shoes, boots, bags and scarves!! Like you I look after them so they last 🙂 they can really transform an outfit and bring it "up to date" so it's useful to have a choice of styles. 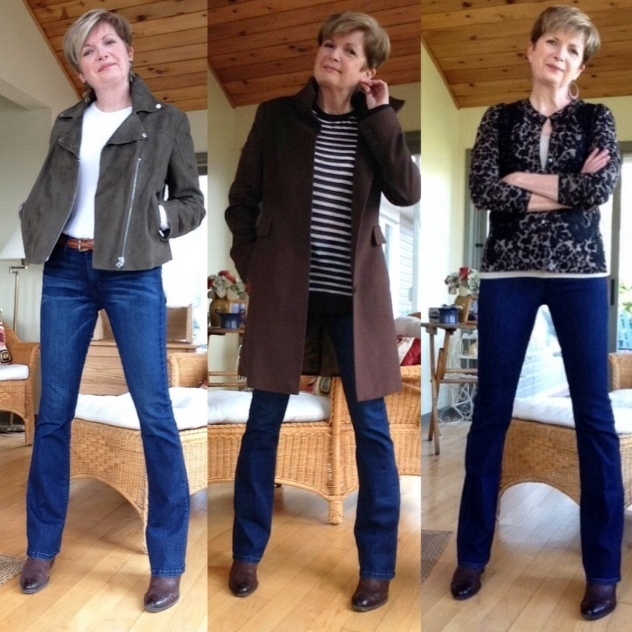 Apart from summer sandals I do tend towards neutral colours although I have recently bought a pair of olive green ankle boots ….similar in shade to your biker jacket, I think. Looking forward to wearing them with navy and burgundy! In a round about way Sue, Sue you could take some credit for me buying those sandals 🙂 it wasn't love at first sight and they were definitely a "head" purchase rather than a "heart". I wanted a pair of shoes that I could wear with lots of my outfits on holiday and they had to be comfortable so I could walk a reasonable distance in them, in cities, in the heat. So I thought carefully …made notes and tried quite a few pairs that ticked all boxes …and they came out top! It worked! I've worn them lots, they're always comfortable and I feel they look smart. Definitely versatile!! So thank you Sue, I'm learning from you! Ha… I take no credit! But those sandals were a great purchase.